This recipe is quite straight-forward and simple: a wet and dry ingredient affair. It does call for 1/2 an egg which I often find fussy, but I followed faithfully here. To do so, beat your egg and use a scale (or a keen eye) to divide it in half. Also, the recipe calls for superfine sugar, but I took my turbinado sugar and ground it down into more of a fine powder in the food processor instead. If this seems like a hassle to you, by all means use superfine sugar or white granulated sugar instead. Soak the raisins in the brandy for 10 minutes. Mix together the flours, cocoa powder, baking powder, baking soda, spices, salt, and dark chocolate. Mix well. Put the butter, sugar, vanilla, and lemon and orange zest in a stand mixer fitted with the beater attachment and beat to combine but not aerate much, about 1 minute. With the mixer running, slowly add the egg and mix until incorporated. Add the dry ingredients, followed by the raisins and brandy. Mix until everything is combined. Then gently knead the dough in the bowl with your hands until it comes together and is uniform. Divide the dough into balls the size of 3 tablespoons and shape each into a round ball. Place the balls on 1 or 2 baking sheets lined with parchment paper, spacing each out about 3/4-inch. Press down gently to flatten cookies slightly. I found that they don’t spread much at all, so the shape they are going into the oven will be similar to the shape they are coming out — I did press them down quite a bit to guarantee a flat cookie. Let rest in the refrigerator for at least 1 hour and up to 1 day. Preheat the oven to 375 F. Bake the cookies for 15-20 minutes (mine took 15), or until the top firms up the center is still slightly soft. Remove from the oven and allow to cool 5 minutes and transfer to a wire rack. While the cookies are still warm, whisk together the glaze ingredients until a thin, smooth icing forms. Pour 1 tablespoon of the glaze over each cookie, leaving it to drip and coat the cookie. 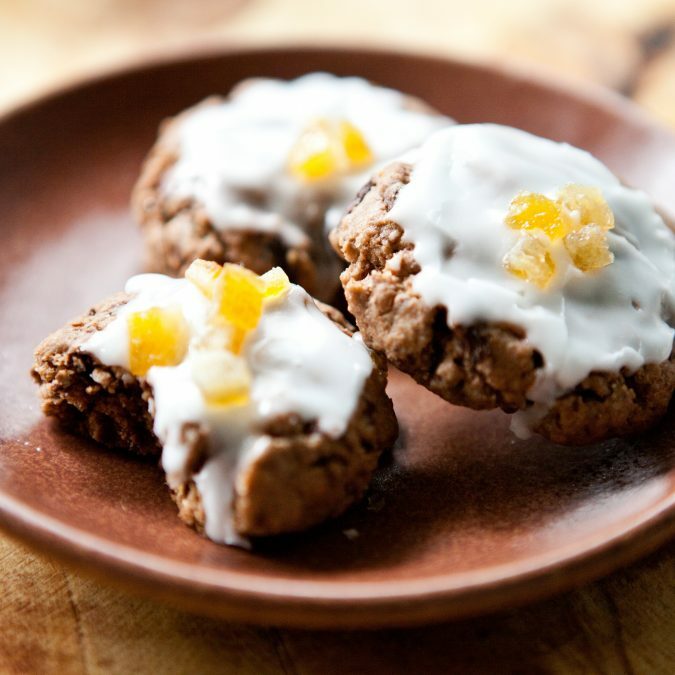 Finish each with a pinch of candied peel placed at the center of each cookie. Store in an airtight container for a day or two.